Sherman's objective was to join Gen. Ulysses S. Grant in Virginia to crush Gen. Robert E. Lee's Army of Northern Virginia. Scattered Confederate forces consolidated in North Carolina, the Confederacy's logistical lifeline, where Sherman defeated Gen. Joseph E. Johnston's last-ditch attack at Bentonville. After Sherman was reinforced at Goldsboro late in March, Johnston saw the futility of further resistance and surrendered on April 26, essentially ending the Civil War. As Gen. William T. Sherman marched north from Fayetteville, Gen. Joseph E. Johnston positioned his army near Smithfield, uncertain whether Sherman's destination was Raleigh or Goldsboro. On March 15, 1865, the head of Sherman's Left Wing struck Confederate Gen. William J. Hardee's skirmishers guarding the road just south of Averasboro. Hardee struck back, and the fight began. 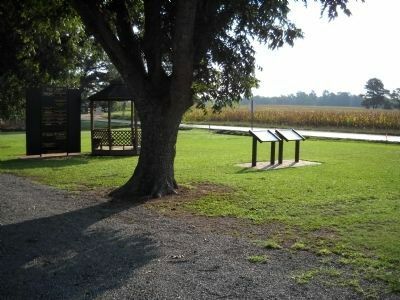 There are several markers at the Averasboro Battlefield Museum. 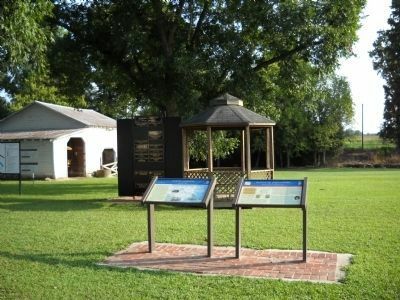 The Third Confederate Defensive Line marker is seen here on the right. from their first and second defensive positions to their third line of defense here. 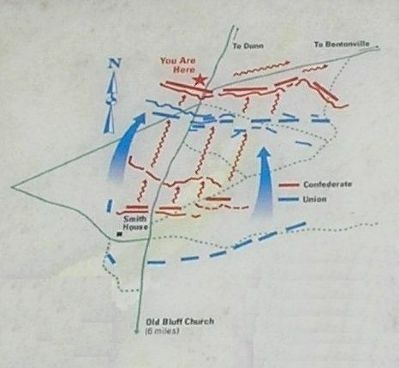 Col. Henry Case’s late morning flanking attack had pushed Col. Alfred M. Rhett’s South Carolina brigade 200 yards north from the first to the second line, held by the brigade of Gen. Stephen Elliott, Jr. Early in the afternoon, Elliott’s line collapsed under Federal attacks, and the Confederates withdrew 600 yards north to the third line. An increasingly heavy rain made the already muddy terrain even worse for troop movements, and Confederate Gen. Joseph Wheeler thwarted an attack on the right flank near the Cape Fear River before darkness ended the fighting. That night, while the Federals made plans to press the Confederates at dawn, Hardee withdrew his artillery and then his infantry, leaving campfires burning to disguise the maneuver. Of about 12,000 Union troops engaged, 682 were reported killed, wounded, or missing, while the approximately 7,000 Confederates lost about 500. Hardee had delayed the Union advance for a day, buying precious time for Confederate Gen. Joseph E. Johnston, who was skillfully uniting his scattered forces for a more substantial attempt to stop Sherman’s progress. The stage was set for the Battle of Bentonville. - Jane “Janie” Smith, 18-year-old daughter of Farquhard Smith, at Smith House on the map. Location. 35° 15.983′ N, 78° 40.324′ W. Marker is near Dunn, North Carolina, in Harnett County. Marker is on McLellon Road (State Highway 82), on the right when traveling south. Touch for map. 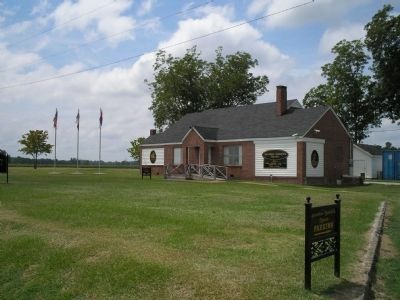 Marker is near the Battle of Averasboro Museum, about 4 miles south of Dunn, NC. Marker is at or near this postal address: 3300 McLellon Road, Dunn NC 28335, United States of America. Touch for directions. (approx. 0.2 miles away); Men of South Carolina (approx. 0.2 miles away); a different marker also named Battle of Averasboro (approx. 0.2 miles away); Confederate Soldiers of McLaws Division (approx. 0.2 miles away); South Carolina Troops at Battle of Averasboro, NC (approx. 0.2 miles away). Touch for a list and map of all markers in Dunn. More about this marker. The marker features portraits of Gens. Hardee and Kilpatrick, along with Jane Smith. A map illustrating the maneuvers described in the text is in the upper center. 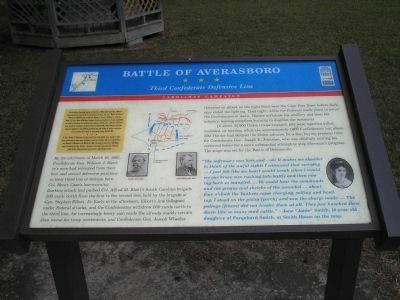 The Battle of Averasboro marker is located beside the museum. Credits. This page was last revised on June 16, 2016. This page originally submitted on November 27, 2007, by Bill Coughlin of North Arlington, New Jersey. This page has been viewed 4,218 times since then and 17 times this year. Photos: 1. submitted on November 27, 2007, by Bill Coughlin of North Arlington, New Jersey. 2, 3. submitted on August 3, 2010, by Bill Coughlin of North Arlington, New Jersey. 4, 5. submitted on November 27, 2007, by Bill Coughlin of North Arlington, New Jersey. • Craig Swain was the editor who published this page.